The quality mills we offer at Pleasant Hill Grain have a wide range of abilities and use a variety of unique designs. This grain mill overview page addresses common grain milling questions, like: How finely should a mill grind? How important is milling speed? What difference does burr type make? With different mills offering very different degrees of versatility, choosing one can seem overwhelming at first—but understanding a few grain mill fundamentals will help you narrow your search down to a grain mill that’s ideal for your needs. The single most sought-after function in a grain mill is the ability to make fine flour from whole grains, including gluten-containing grains like hard wheat, spelt or rye, as well as gluten-free (GF) choices like rice, oats and quinoa. For most users, this fine flour ability is a non-negotiable, “must have” feature. How fine is fine enough? Most home grain mill users are mainly interested in making whole grain bread with excellent rise and texture, and every one of our grain mills will produce an ideal grind for bread flour from a wide variety of grains. If you’re interested in making pastries, you’ll want a mill that can grind to an ultra-fine texture. The finest grinding ability is also required to make fine flour from white rice, a staple grain for many who follow a gluten-free diet. In a moment we’ll discuss what grain mill characteristics to look for if ultra-fine grinding is among your goals. Certain design and performance factors are important to understand as you begin the process of selecting a grain mill. The overview below will provide helpful perspective on different mill designs and their suitability to achieve your aims. Our product pages provide the most detailed information on individual mills, but it’s helpful to understand the forest a bit before you start studying the trees. Quality stone burr mills are made in every size from small to very large, with output speeds to match. They’re quieter than impact mills. Every stone burr mill we offer has the widest possible texture range; they can produce ultra fine or very fine flour, coarser flour, meal texture, cereal grind, and even cracked grain. The stone burrs in most modern small mills have a synthetic engineered composition for precision, uniformity, efficient grinding, and long burr life. Quality modern mill stones are long lasting, cool-grinding, and never contribute grit to your flour. Stone burr mills grind all dry grains and beans and some can be used for small quantities of fibrous materials like dried spices. They aren’t suitable for wet or oily materials. A combination of timeless design and modern technology, these mills are heir to a tradition that spans millennia. Both electric and hand crank stone burr mills are available. 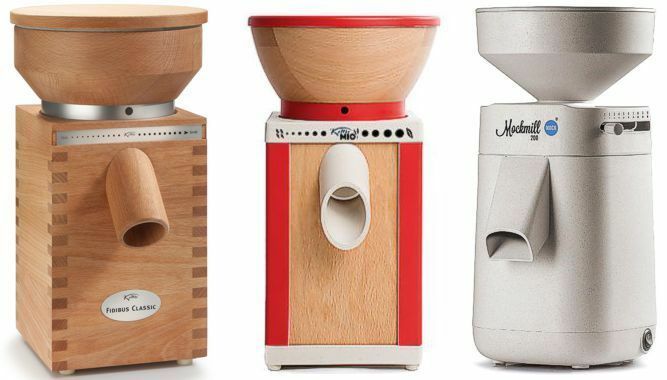 Austrian-made KoMo grain mills combine the most advanced ceramic-corundum burr design with German-manufactured motors and handsome hardwood cabinetry. KoMo’s exciting new Mio line offers the same internal milling design and your choice of colorful trim options, with some components made of revolutionary new Arboblend biopolymer. Mockmill grain mills also offer ceramic-corundum burrs, and feature cabinets made entirely of Arboblend. Also called micronizers, this popular design offers high speed performance at moderate cost with above-average sound level. Impact mills are electric-only. 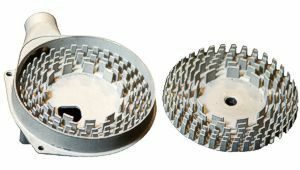 As seen in the accompanying image, impact mills feature a milling chamber with concentric rings of stainless steel fins. The fins, which never touch each other, spin at tens of thousands of revolutions per minute and burst grain kernels into small pieces as they’re impacted. Impact mills produce flour only, typically in a range adjustable from coarser flour to very fine flour; they cannot grind a cereal texture, or coarser cracked grain. They’re suitable for dry grains and beans, and cannot grind oily, wet or fibrous materials. Impact mills have become very popular since their introduction about thirty years ago. The market leaders in this category are the NutriMill Classic and the WonderMill. Like stone burr mills, steel burr mills turn at relatively slow RPMs, are fairly quiet, and have a wide range of adjustability that starts with cracked grain, runs through cereal and meal texture, and all the way to very fine flour. Few steel burr mills can grind to an ultra fine texture, but the Country Living mill is an exception to that rule as its large precision-cast stainless steel burrs can grind grain (even hard white rice) exceptionally fine. Most of our steel burr mills are available as hand-crank models, with motor components available to run them on electric power when desired. 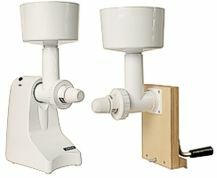 The popular hand-crank Wonder Junior Deluxe grain mill offers an optional adapter for operation with an electric drill. The Wonder Junior mill also crosses burr-composition categories by coming standard with both stone and steel burrs. 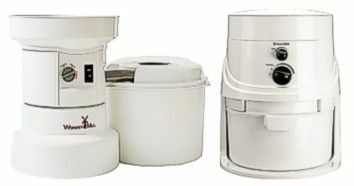 The Family Grain Mill is a modular system that allows quick-change choices of motor or hand drive units, and processing heads that include a flour mill, grain flaker, meat grinder and food processor. Made in Germany to exacting fit and finish tolerances, the Family Grain Mill offers exceptional versatility. Because their grinding surfaces are nonporous, steel burr mills can grind some materials that are wet, oily or fibrous. All of the steel burr grain mills in this section feature long life, replaceable grinding burrs for years and years of peak performance. 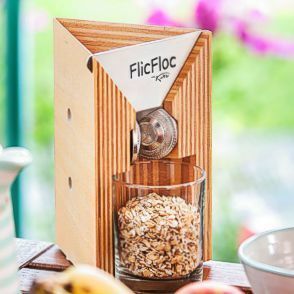 A hand crank mill will let you make flour without electricity, whether the power goes out unexpectedly or you’re at a site that never has power. And to give you the plug-in alternative, motor drives are available for all of our hand crank grain grinders. There are a number of poorly-designed mills on the market that require such a high turning effort that they really aren’t of any practical use. You don’t have to worry about that problem with a mill from Pleasant Hill Grain because we don’t sell mills like that. 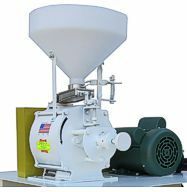 Nevertheless, grinding hard grain into fine flour takes a fair amount of power, and many of our customers like to have a motorizing option for their hand crank mill, both for ease of use and for the higher output speed that a motor provides. Some start out with the whole setup, and others begin with the manual mill and add the motor later. Flour output speed varies considerably between mills. If you’re shopping for an electric mill, consider how important speed really is to you before you give this factor a lot of weight. Once it’s started, an electric mill will finish its job hands-free while you go about other kitchen tasks. For commercial users, a certain minimum production capacity may be essential. But for a home baker who typically grinds a single batch, you can probably compensate for a somewhat slower output speed simply by starting the mill a couple of minutes earlier. With this in mind, many shoppers find that other characteristics are at least as important as a mill’s output speed. The discussion on this page relates mainly to home-use grain mills. If you’re a small business owner (bakery, etc.) working with a limited budget, you may be considering using a home-use mill for small scale production grinding. But we also have excellent small commercial grain mills that are designed for continuous-run grinding, and are covered by commercial warranties. Our most popular small commercial grinder is the KoMo XL Plus grain mill, and another commercial grain mill to consider is the Meadows 8” stone burr mill which features natural North Carolina granite burrs. We also offer larger commercial grain mills with burrs up to 30" diameter. Another category of grain mills is flakers. Most often used to make fresh oatmeal from oat groats (oats with the hull removed), flakers create a flake that’s thicker and chewier than the paper-thin flakes available in grocery stores. Because flaking grain requires much less energy than grinding flour, most flakers are manual. KoMo makes two of our most popular flakers, the hand-operated KoMo FlicFloc and the electric FlocMan flaker. 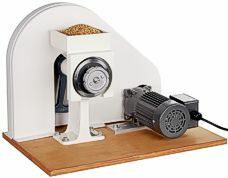 The modular Family Grain Mill system includes an excellent flaker that can be hand or motor operated. KoMo also builds combination mills that include electric grain mills with electric or hand crank flakers; you can see all of our flakers and grinder/flaker combos here. The table below lets you compare the features and key specs of many of our most popular grain mills, and more details are available on individual product pages. If you have questions not answered here or would just like to discuss your particular needs, our knowledgeable customer service representatives would love to talk with you. Milling rate is based on grinding hard white wheat to a breadflour texture. Rate is measured in ounces per minute. Hopper fill capacity was figured using hard white wheat. Specs for the KoMo Classic match the KoMo PK 1, KoMo Medium, and KoMo Duett 100, excluding the dimensions, weight and hopper capacity. The Duett 100 includes an electric flaker, which makes the appliance larger and heavier than the Classic. Electric operation of the Wonder Junior Deluxe requires purchase of accessory equipment. 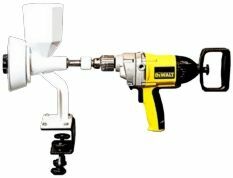 The electric drill adapter is available here; pulley and sprocket options are available as well. Specs for the KoMo Fidibus 21 match the KoMo Magic, excluding the dimensions, weight and hopper capacity. Specs for the KoMo XL match the KoMo Duett 200, excluding the dimensions and weight. The Duett 200 includes an electric flaker, which makes the appliance larger and heavier than the XL. The KoMo XL Plus features a motor with 100% duty cycle, allowing it to run nonstop. The warranty for the XL Plus applies for either home or commercial use. Milling area of 5.72 square inches, which is comparable to a 2.7 inch diameter plate steel burr. (ceramic-corundum) 3.35" 8-9 — 360W 2 lb 1 oz W: 7.8"
(ceramic-corundum) 2.95" 5-6 — 250W 1 lb 15 oz W: 7.2"
(ceramic-corundum) 4" Variable Yes — 1 lb 10 oz W: 13.5"
(ceramic-corundum) 3.35" 10-11 — 600W 2 lb 10 oz W: 8.2"
(ceramic-corundum) 3.35" 12 — 600W 2 lb 10 oz W: 8.2"
(ceramic-corundum) 3.35" 8-9 — 400W 2 lb 11 oz W: 6.5"
(ceramic-corundum) 3.35" 8-9 — 360W 1 lb 14 oz W: 7.25"
(ceramic-corundum) 5.5" 17-18 — 746W 4 lb 5 oz W: 11"
(ceramic-corundum) 3.35" 8-9 — 360W 2 lb 4 oz W: 9.5"
(ceramic-corundum) 3.35" 8-9 — 360W 1 lb 15 oz W: 10.9"
(ceramic-corundum) 2.95" 5-6 — 250W 1 lb 15 oz W: 10.9"
(ceramic-corundum) 2.95" 5-6 — 250W 2 lb W: 7.7"
1500W 7 qts W: 32"
(ceramic-corundum) 3.7" 7 — 600W 2 lb 7 oz W: 7.5"
(ceramic-corundum) 3.7" 3.5 — 360W 2 lb 7 oz W: 7.5"
(ceramic-corundum) 3.25" 6-7 — 450W 1 lb 5 oz W: 6.8"
Impact 3.5" 24 — 1250W 3 lb 12 oz W: 16.3"
Impact 3.5" 17 — 1200W 5 lb W: 11"
Impact 3.7" n/a — 1200W 6 lb 6 oz W: 18"
Impact 6.25" 4.7 — 746W 5 lb W: 9.3"
(conical) 1.34"7 3 Yes 150W 2 lb 1 oz W: 5"
(plate) 5" 0.82 Yes 288W 1 lb 14 oz W: 23.5"